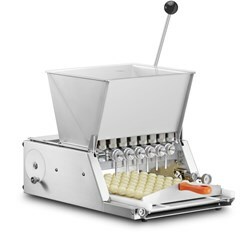 This Depositor is used for manual, metered deposits of chocolate, caramel, gummy and hard candy into molds. Manual operation allows for gentle depositing to give an improved product quality. The digitally controlled, heated Hopper, allows you to work with higher temperature settings and fill 6 to 8 mold cavities at once, allowing increased productivity. Maximum temperature: 320°F/160°C.